Throughout our lives, the kitchen is often a central place for family interaction and activity. As we age, however, daily tasks such as preparing and cooking food may become more difficult to do. Scroll down to learn about common problem areas in the kitchen and solutions to make your kitchen more supportive. Click the arrows below to learn about common problems related to safe and supportive aging in the kitchen, and solutions that can address them. Explore the Solutions Gallery to view photos from actual homes that demonstrate how design and product changes can support independent living. Please note: the photographs on this website represent possible solutions to various challenges and should not be taken without consideration of individuals’ specific needs and environments. Obtaining professional advice and/or assessment is strongly recommended before making changes to the home. Add shelves and hooks under cabinets, or install a wall rack. Install drawer organizers and pull-out shelving. Use lever or U-shaped pulls or handles or touch latches. Place heavier and frequently used items within easy reach. 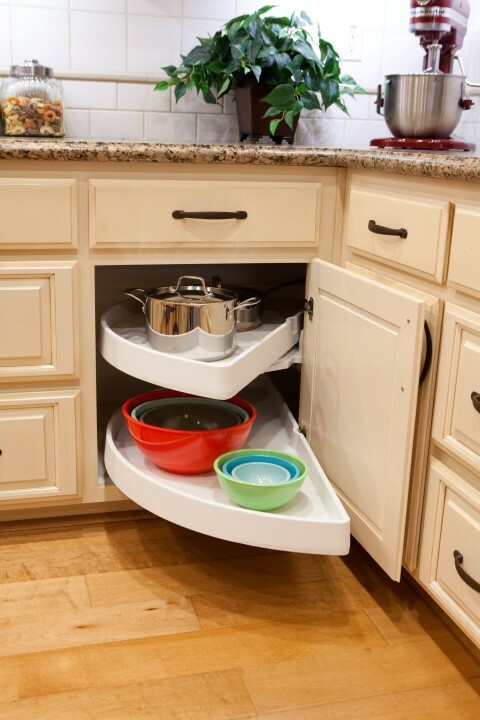 Pull-out shelves make it easier to reach frequently used items. ©Livable Design by Eskaton. Install task lighting where food is prepared. Ensure lighting is non-glare and non-reflective. Install non-glare and non-reflective task lighting where food is prepared. It can help make activities in the kitchen easier - especially for those with vision problems. ©Livable Design by Eskaton. 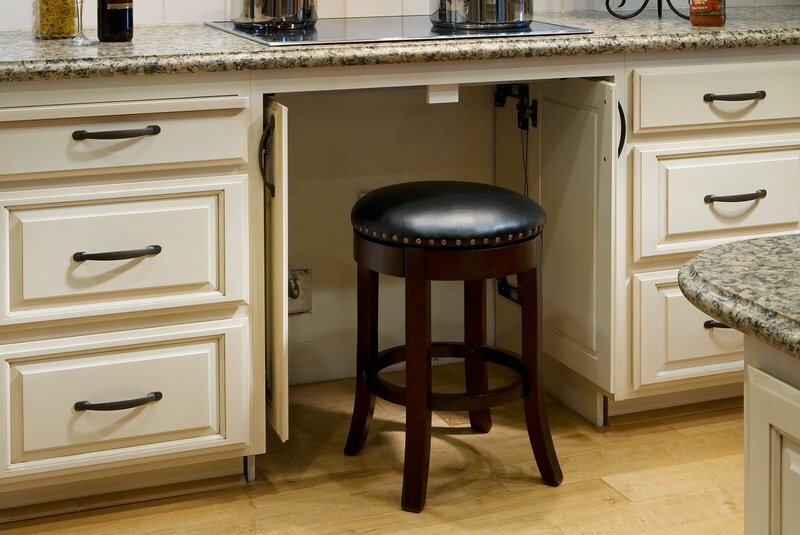 Use a stool for sitting while completing tasks. 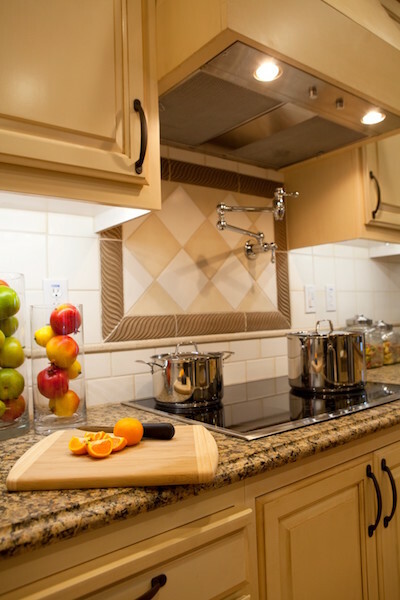 Create round corners on all countertops. 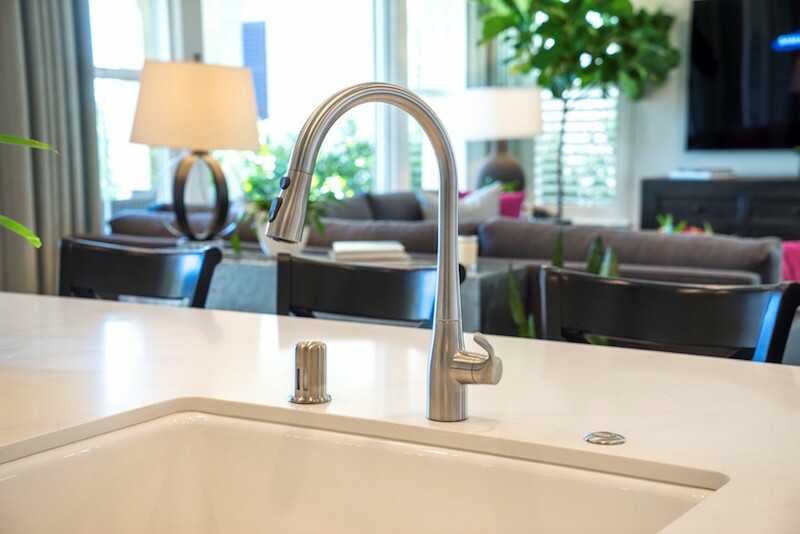 Install a faucet with a single-lever handle that is easy to turn on and off. A single lever faucet is easier for arthritic hands, or messy hands, to turn on and off while cooking. They are available in various sizes and styles. ©Livable Design by Eskaton. Disclaimer: Information included on this website may contain references or cross references to other agencies, products, programs, or links. The University of Southern California, Leonard Davis School of Gerontology, Fall Prevention Center of Excellence (FPCE) does not endorse nor qualify any of the included agencies, products, programs, or links. The listing of these providers, products, programs, and services is for informational purposes and individuals must use their own caution and judgment when using these resources. FPCE does not hold any liability or personal interest in any of these agencies, products, programs, or services.